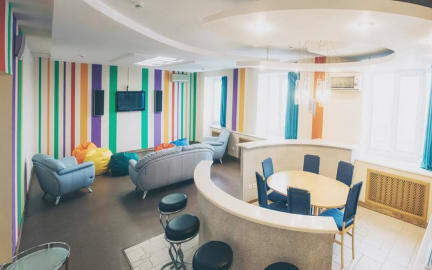 Hostel eHOT i Kazan, Rusland: Reservér nu! You can easily find us because we are located in the center of the city, within minutes of walking distance of railway station, next to the Kazan Kremlin and local places of interest, close to public transport stops. It is 15 minutes to the Kazan Kremlin on foot and 10 minutes to a central street of Bauman. There are 43 rooms for 113 people in the hostel. Modern rooms equipped with the wireless Internet access, cozy single beds, with possibility of conjunction. Comfort rooms type equipped with air conditioning, minibar, HD television. 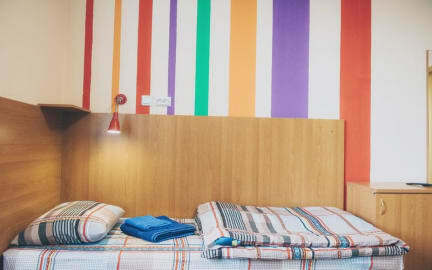 The main difference of our hostel is that all beds are single-tier, with individual cabinets. Every bed equipped with a wall lamp and a socket. Additional services: free Wi-Fi, laundry services (washing machine, 2 ironing tables, irons), the safe on a reception on the deposit, the hair dryer on a reception on the deposit, the parking for cars 100 р / days, luggage room. Breakfast is not included - 120 RUB per person per day.